Microsoft's Head of Security and Privacy in the UK has told TechRadar that people who jump ship from Internet Explorer after the recent spate of bad headlines risk ending up on a less secure browser. , the company has not ruled out that something similar could be used against the later versions. 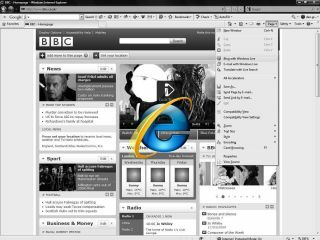 With Microsoft not prepared to give details of how soon a fix will be released, and advising people to leave the appalling IE6 and its successor for the latest version – IE8 – Microsoft's UK security chief Cliff Evans insists that a non-Microsoft browser is the worse option. "The net effect of switching [from IE] is that you will end up on less secure browser," insisted Evans. "The risk [over this specific] exploit is minimal compared to Firefox or other competing browsers… you will be opening yourself up to security issues. "There are broader risks and issues with other browsers." Evans believes that the coverage attached to the problem – which was namechecked by Google as it changed its China policy – is "not representing the situation". "The reality of the risk is minimal, even if you have IE6; you would have to go to a website running the exploit." The whole Google IE flaw issue is clearly a PR disaster for Microsoft, with Evans conceding that this particular problem is not likely to afflict IE's rivals. "I'm not aware that the vulnerability exists in other products," says Evans, "But those products may have other vulnerabilities." Asked directly when a fix would be ready, Evans states that the rollout might or might not be before the normal upgrade cycle, but has no further details. "We are working to provide an update to the vulnerability. We are not seeing any attacks on IE8." In the meantime, the company will be hoping that the knee-jerk reaction of France and Germany is not mirrored elsewhere.